A colour slide of the Powerhouse at Boldt Castle on Heart Island in the St. Lawrence River before the renovations. In this view a motorboat can be seen in the foreground. 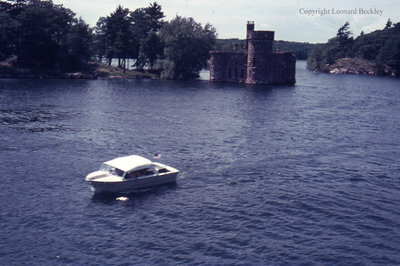 Powerhouse at Boldt Castle on the St. Lawrence River, June 1976, Leonard Beckley. Whitby Archives A2014_004_038.